Blueberrys and Strawberrys are coming into season in these parts so I got some organic blueberrys at the local Fresh Market. 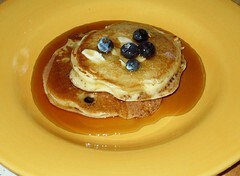 Earlier in the week I topped a spinach salad with blueberries and it was delicious, but lets be honest, what better than pancakes to make use of these little juicy morsels gifted us by mother nature? I digress – these were a great way to start the end of the week – I never get up and cook breakfast, but my cereal, I discovered, has high fructose corn syrup. I really like Rachael Ray’s magazine. The best part about it is you get the great 30 minute recipes, without having to hear her annoying voice and watch her ridiculous mannerisms. This turned out really well. I tweaked a few things, and I’ll note them in the recipe. 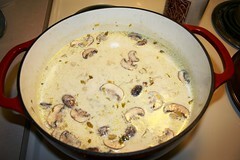 This soup paired very well with the salad and mayannaise biscuits I made. And the leftover Quadruple Chocolate Loaf Cake rounded off a pretty darn perfect meal. This is just once again proof that even though we are 1700 miles apart, Mimi and I share a brain. 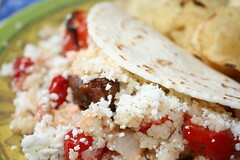 I had these in the works before I saw her blog about the chicken tacos. 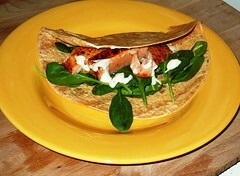 My tacos are salmon, spinach, cucumber and sour cream seasoned with tomatilla sauce. Season Salmon filet with kosher salt, pepper, chili powder and the juice of 1/2 lime. Grill until just done (mine took about 7 minutes). Slice the salmon and add to tortilla (mine are sun dried tomato) along with spinach and chopped cucumber and then drizzle with the sour cream sauce. It was a delicious and nutritious dinner! At long last- I have finished my project for the Nigella Lawson contest over at one of my favorite food blogs, Foodie Chickie. Basically I could choose any Nigella recipe I wanted. I have had this recipe for quite a while and I’ve always wanted to try it. Now I had my opportunity! Let me start by giving you the recipe. The recipe said to put oiled foil in a 2-pound loaf pan. Because I have a phobia about large cakes and loaves not ever setting up at this altitude, I opted for my small loaf pans- kind of like gift loaf sized. 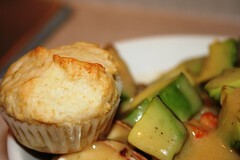 I also used a 6-muffin tin. I cut foil in squares, oiled it and put it in the individual loaf compartments. I used cupcake papers in the cupcake pan. Preheat oven to 325 degrees and put a large sheet pan in it. Take whatever you need out of the ice box, because everything needs to be room temp when you begin. Put the flour, baking soda, cocoa, sugar, butter, eggs, vanilla and sour cream into the food processor and blitz until a smooth, satiny brown batter. Scrape down with a rubber spatula and process again while pouring the boiling water down the feed tube. Switch it off, then remove the lid and the well scraped double-bladed knife and, still using your rubber spatula, stir in the chocolate chips. Pour batter into loaf pan and put into the oven, cooking for 1 hour. Because I used individual gift loaves, mine only took about 1/2 an hour. When ready, the loaf will be risen and split down the middle and a cake tester will pretty well come out clean. Not long before the cake is due out of the oven (when it has had about 45 to 50 minutes), put the syrup ingredients of cocoa (or fruit preserves), water and sugar into a small saucepan and boil for about 5 minutes, to give a thick syrup. Take the cake out of the oven and sit it on a rack, still in the tin, and pierce here and there with a cake tester. Pour the syrup over the cake. Let the cake become completely cold and then slip out of its tin, removing the foil as you do so. Sit on an oblong or other plate. Sprinkle chocolate splinters over the top of the sticky surface of the cake. My smaller loaves did not come out very pretty. 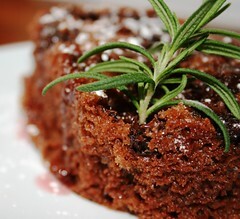 For this pic, I put a sprig of rosemary over a gaping hole in the cake. They taste amazing, however. 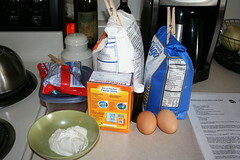 I will make this again, and maybe even trust the loaf pan to see if it will set up. As soon as Dev finishes his math project board, these ingredients are going to go hurled together to make Nigella Lawson’s Quadruple Chocolate Loaf. I will post again with the results!